Garbage trucks will only pick up yard waste if it's been requested via 311, a Department of Streets and Sanitation spokeswoman said. CHICAGO — City garbage trucks will drive past bags of yard waste unless their owner first calls 311 to arrange a pickup, an official said Thursday. The Department of Streets and Sanitation is disputing a Thursday WBEZ report that said garbage trucks were picking up yard waste, which would violate state law by bringing leaves and branches to a landfill. "If someone wants to have their yard waste picked up, all they have to do is leave it in a separate bag from the rest of their trash, then it's as easy as calling 311," Streets and Sanitation spokeswoman Jennifer Martinez said. "Then we'll send out a separate truck to have it picked up and composted." WBEZ, however, has a photo of a Streets and San worker putting yard waste in a garbage truck. The opt-in system went into effect several years ago, Martinez said, after department officials "took a look at the program and considered what would be the most efficient way to get that collected." The WBEZ report pointed out that it's not easy for Chicagoans to find out about the opt-in system. Aside from press releases posted on the department's website every spring and fall, the city has few ways of alerting residents to the dial-for-service system. 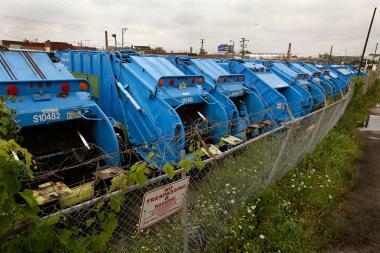 But with Recycle by City, a new website launching in Chicago next month, officials hope to change that. "We're going to be using this website and running advertising campaigns to keep pushing this message so people know how easy it is to have your yard waste picked up," Martinez said. The department will also use the site, in addition to a series of CTA billboards, to educate residents about the upcoming ban on bags in recycling bins, she said. The amount of yard waste collected in the city has fallen sharply since 2010, Martinez said, but thanks to increased advertising efforts, that number has seen an uptick since last year. "We think everyone wants to do their part to help the environment, especially once they see how easy it is," Martinez said. "So I think our continuing education campaign is helping a lot in that process."